Our DJs really know how to make Heist pop! Last month, a few of our incredible DC DJs stole the scene at Heist in DuPont! 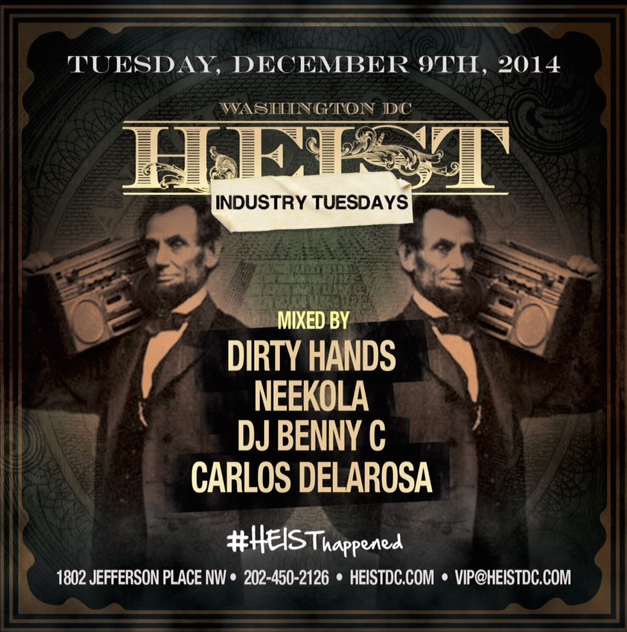 As one of Pelonkey‘s partner venues in DC, Heist is one of the most unique nightclubs in the city. It has a fun bank robbery scene (hence the name!) and all gold embellished decor. Including Dirty Hands and Neekola, the music was bumping! One of our other partners, the Beat Refinery, had their main lady DJ Alkimist pop in to party as well! Selfie time! All around another amazing night at Heist for their Industry Tuesdays. Catch you there next time! Our CEO, DJ Neekola, had an amazing birthday party at Heist last month! Content modified from Ciera Gallub‘s post on DJ Neekola’s blog on 11/5/14. 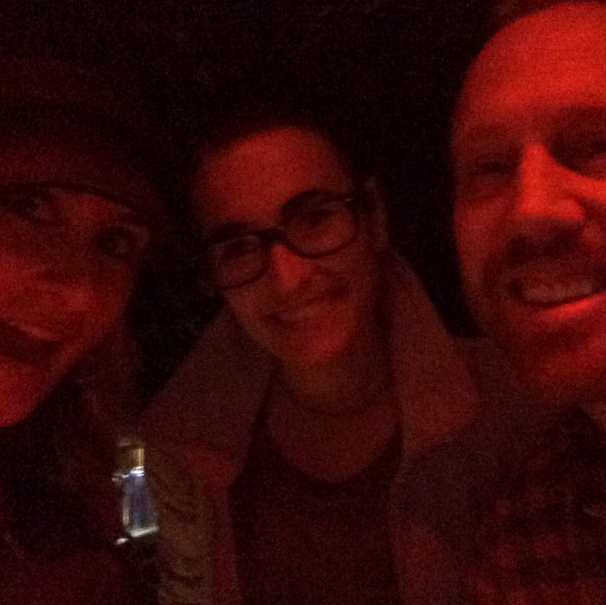 Were you there at Pelonkey CEO DJ Neekola‘s birthday party at Heist last month? What a great night! Not only did Neekola want to celebrate turning 21, she also wanted to show off her amazing tech startup, Pelonkey! We were giving away awesome swag and raffling off some super cool prizes! Chuck Levin’s sponsored a couple pairs of headphones as well as an entire JBL sound system! Congrats to our Pelonkey winners! All proceeds from the raffle ticket sales went to both the Meant 2 Live Foundation and Pelonkey’s crowdfunding efforts! Neekola had such a great time rocking out with all of the Pelonkey DJs on the decks that night, and she even hopped on herself for a minute! A big thanks to all of our DC DJ’s that played that night at Heist – Hi Def, Wizdom, Welbot, Oz, Alkimist, Vicious, Phlipz, Ri5e, Dirty Hands, you’re all amazing!! And thank you to Heist for hosting such a great event! Huge shoutout to everyone who came out and partied with us – you’re all the best! Make sure you all sign up for Pelonkey! We want your talent and your party needs – our Pelonkey team will take care of you!! 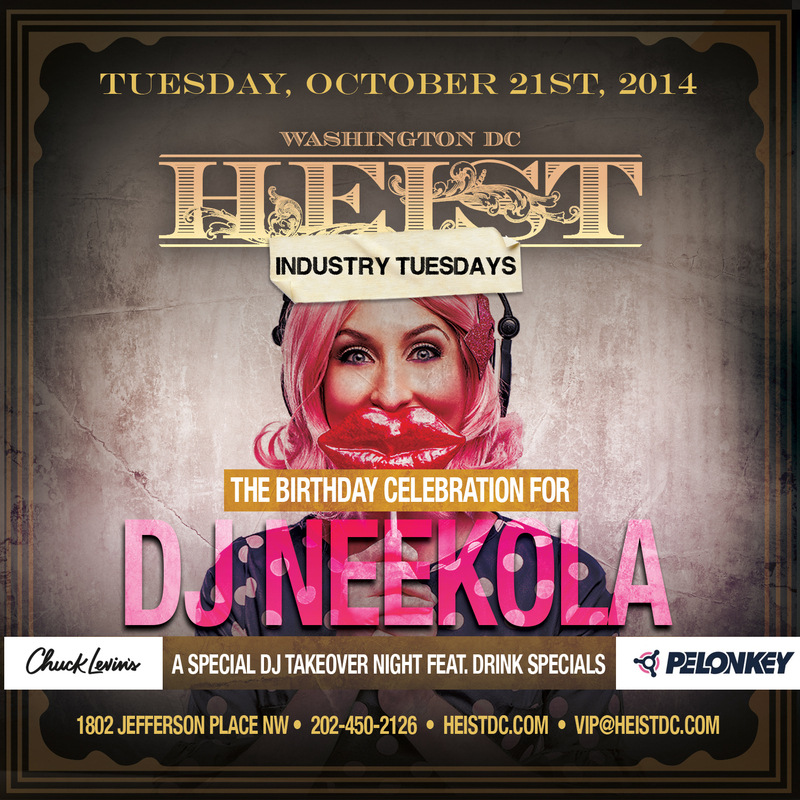 Tonight is Pelonkey CEO DJ Neekola’s birthday at Heist! Tonight the Pelonkey team celebrates our wonderful CEO, DJ Neekola turning 21 again! We are all rockin’ out at Heist tonight to celebrate, as well as give away some awesome raffle prizes from Chuck Levin’s! Featuring a killer line up with a DJ Takeover, the city’s best Pelonkey DJs will be shredding the decks to make for what is fo sho to be a truly epic night! Pelonkey will be reppin’ some awesome swag and announcing the raffle winner late in the night for our amazeballs prizes, including a JBL sound system and DJ headphones! Buy a couple raffle tix at the door, and these will enter you in to win the booty! Note – if you’ve already signed up on the Pelonkey site before 5pm today, you will automatically receive 2 free raffle tix! If you sign up tonight at the event, you will receive 1 free ticket entry! Otherwise, everyone is welcome to purchase the tix, 1 for $5 or 3 for $12. Purchase away because proceeds will go to the Meant 2 Live Foundation, as well as Pelonkey’s crowdfunding! Heist bartenders will be shaking up some fantastic specialty cocktails and drink specials, so come on out for a good time! Everyone will be there anyways, so you may as well come and show Neeks some love on her birthday and say hi to your Pelonkey team. See you tonight!